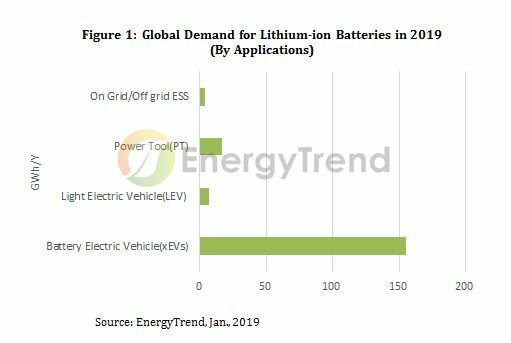 According to the latest research by EnergyTrend, a division of TrendForce, the market of new energy vehicle will continue to grow steadily, driving the demand for xEV batteries, despite the slowdown in global automotive market since 2018. The global demand for lithium-ion batteries used in new energy passenger cars is estimated to reach 155GWh in 2019, a growth of 63% from 95GWh in 2018. According to Duff Lu, senior research manager of EnergyTrend, China has become the world's fastest-growing market for new energy vehicles driven by the government’s subsidies and supporting policies. After a rapid growth in 1H18, the shipments of new energy cars in China slowed down in 2H18, moderating the demand in the xEV battery industry as well. 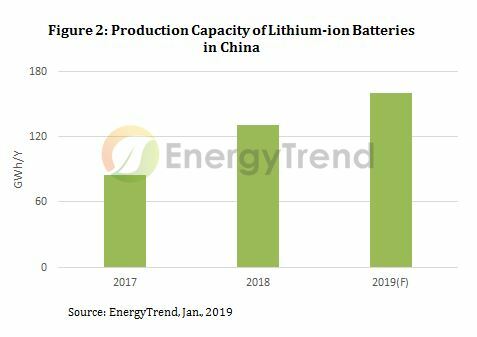 However, with increasing penetration of new energy vehicles, the demand for lithium-ion batteries used in new energy passenger cars in China will grow to 54GWh in 2019, a growth of nearly 80% from 30GWh in 2018. In terms of supply, the production capacity of xEV battery in China has surpassed 134GWh by the end of 2018, and has a chance to reach 164GWh in 2019. Amid the oversupply and phasing out of subsidies from the Chinese government, the industry has been faced with a reshuffle since the second half of 2018. Major manufacturers have grown stronger at the expense of the demise of smaller companies. Leading players like Contemporary Amperex Technology (CATL) and BYD continue to expand, while less competitive ones who rely too much on regional markets, such as OptimumNano Energy, may have to exit the market during the market reshuffle. EnergyTrend expects that, with new capacity entering operation in 2019, the xEV battery industry will become more concentrated. The top five battery manufacturers would continue to grow and become the major suppliers. Subsidies from the Chinese government will be phased out by 2020, but before that, the industry will still depend on the subsidies to cover their R&D costs for advanced battery technologies. Manufacturers need to continue the development of high energy density solutions, building up competitiveness, before the electric vehicle market enters the maturity stage.